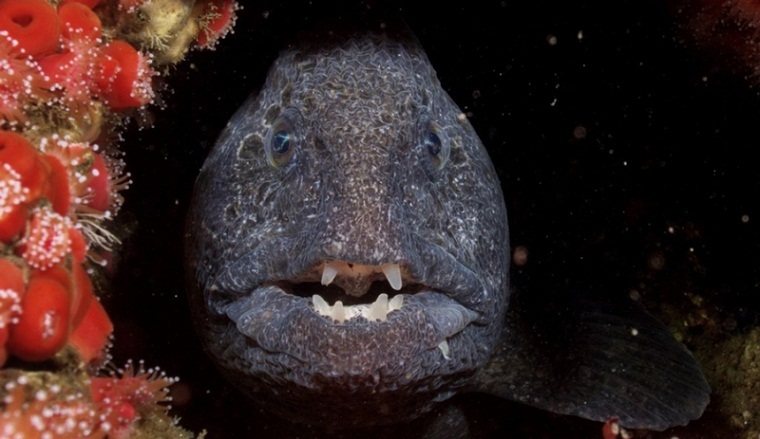 The Wolf Eel is a species of fish that are often confused for true eel. However, unlike their name, these are not related to the other true eel species but are rather one of the five ‘wolffish’ species. However, the eel-like appearance of this particular species is unique since the other four species do not possess such long and skinny features. 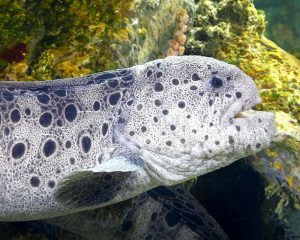 Size: The wolf eel can reach up to 8.2 feet (2.5 m) in length. Weight: The maximum weight of these fish can be 18.4 kg (41 pounds). Body: The wolf eels are gray in color having numerous blackish vertical spots and bands all over the body up to the tail region. Eyes: Large to medium round eyes that are dark brown or black. Teeth: A small row of spiky front teeth are present in each jaw. Sexual Dimorphism: The males are typically lighter in color compared to the much darker females. Wolf eels usually live for about 25 years. 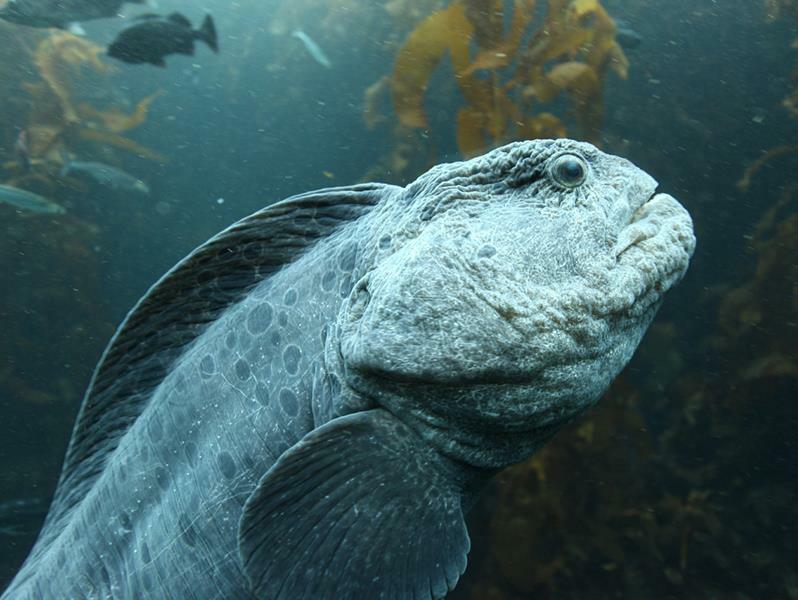 Wolf eels are found in the North Pacific along the coast of North America from the Seas of Japan and Okhotsk, and the islands off the coast of southern Alaska to California. 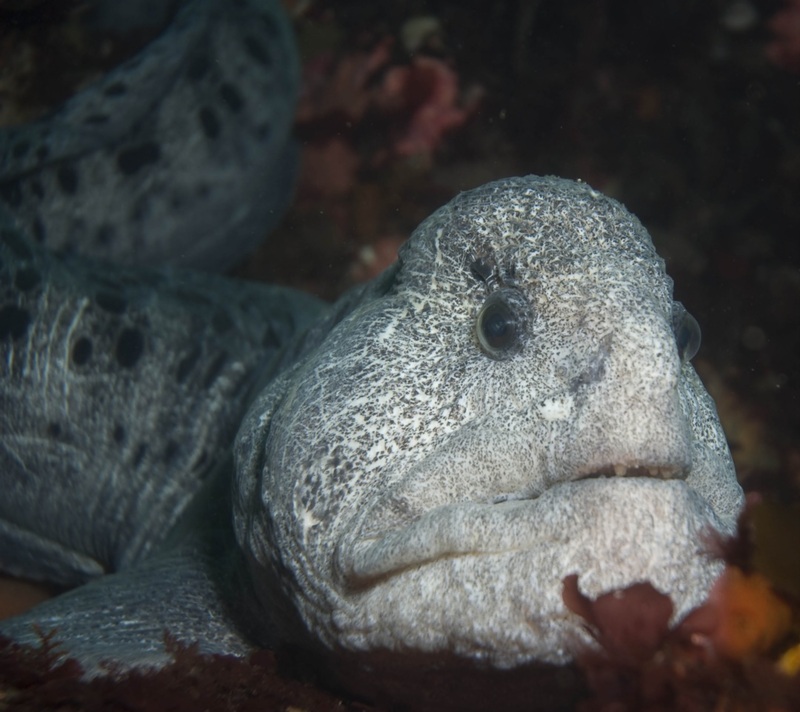 No regional subspecies of the wolf eels have yet been assigned. Wolf eels usually inhabit rock and stone crevices, dens, and caves in the reefs. The wolf eels are said to be gentle in nature and harmless to humans. These are creatures that move slowly through the waters and have often been seen interacting in a very friendly manner with the divers. They would even gently eat out of their hands. 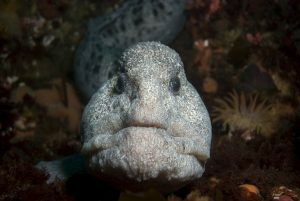 The fish are believed to create a bonding with its pair for an entire life, while both the partners would occupy the same den every year, and probably continue to do so throughout their life as long as they are not forced to leave the place by larger wolf-eels or bigger marine creatures like the Giant Pacific Octopus. 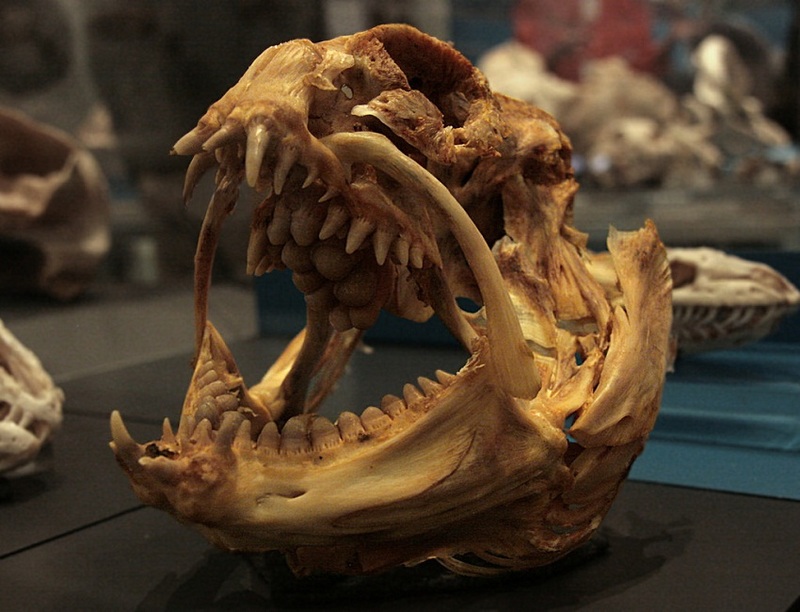 The diet of a wolf eel varies throughout its life. Young will feed on plankton while adults eat crabs, clams, sea urchins, mussels, sand dollars, and snails. Wolf eels begin to pair up at the age of 4 years, and at 7, they start to reproduce. After a successful mating session, the female wolf eel lays a large mass of egg consisting of about 10,000 eggs in a single brood, inside their den. 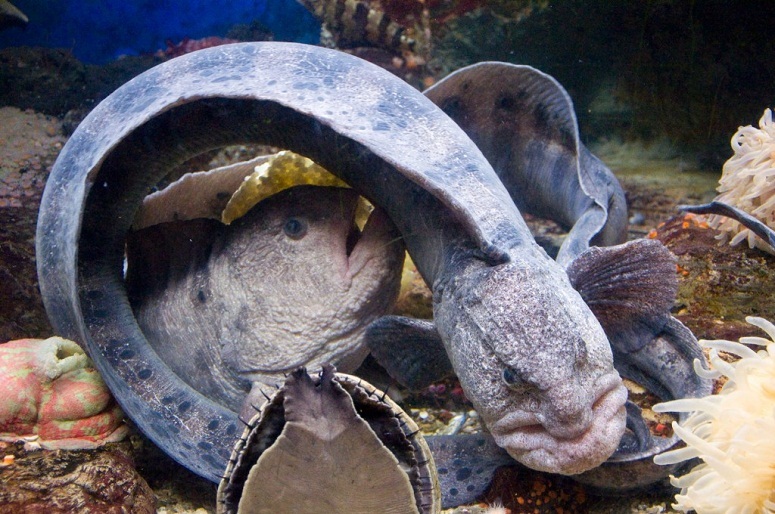 Both the father and the mother wolf eels guard the eggs, wrapping their bodies around, protecting them from predators. During this time, only one of the parents will leave the eggs at a time in order to search for food. The eggs hatch out in around 16 weeks. 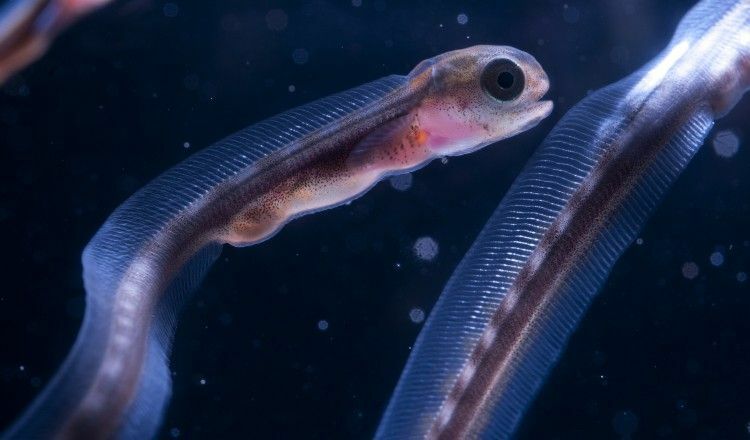 The larval/baby wolf-eels or fries drift towards the upper part of the ocean water, and remain there for about two years, after which they settle downwards. Unlike the gray adults, the juvenile or young ones are orange. The wolf-eel’s jaw is powerful and hard, adapted to crush hard objects around its environment, including the spiny sea urchins, hard-shelled crustaceans, clams, snails, mussels, and several other fishes. Since these fish live in the rocky regions of the ocean reef, they are able to squeeze their bodies so that they can enter small crevices. The appearance of the fish is apparently ‘scary’, with its rugged tone, large eyes, and toothy mouth, helping them scare off many predators. The seals often feast upon the adult wolf eels, and other larger eels, sharks, etc., while the young ones fall prey to fishes like kelp greenling and rockfish. The populations of the wolf eel seem to be quite stable; however, they have not yet been classified by the IUCN 3.1 Red List. This fish species is considered a delicacy in many regions around its habitat, while its white, tender and sweet flesh is said to be “good to eat”. 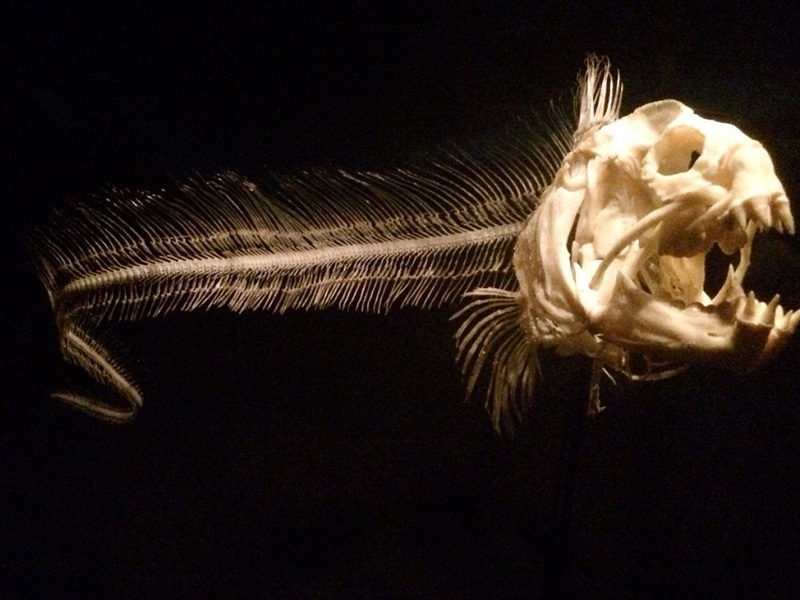 In some Native American tribes dwelling in the northwest coastal regions, this fish was thought to have supernal powers and was considered to be sacred. They called it “doctorfish”. In some tribal cultures, only the tribal healers had the right to consume the wolf eel since they thought that the fish could enhance their healing powers. If threatened or provoked, these fish have been reported to have inflicted painful bites on humans.